Following the trend to use its infinity screen, Samsung has launched the Galaxy A5 (2018) with this feature included. This provides the device with a larger display and a better looking at pictures, videos or applications. The front dual camera is at 16MP and 8MP and it turns to be a great selfie and group photographic tool with bright colors and good accuracy in details. Same characteristics go to the primary camera at the rear, and with the Super AMOLED display at 5.5 inches the images look amazingly vivid. The screen allows the reproduction of HD videos since its resolution lies in the 2160 x 1080 range with a high 439 dpi density. The display is protected from scratches and dust by using Corning Gorilla Glass. Beneath the rear camera, a fingerprint sensor can be found, adding a good sense of protecting your phone for outsiders. Contrary to most of other smartphones, the volume controls are located on the left side of the device; something that would be awkward for the user who is used to handle the phone with the right hand. 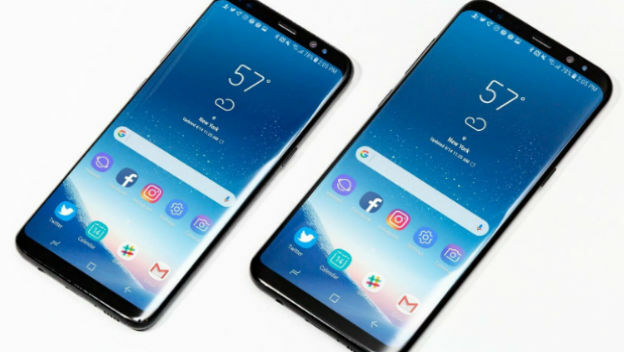 On the right, there is a single button placed there to launch the Samsung’s digital virtual assistant: Bixby. The A5 2018 smartphone is operated under the Android 8.0 (Oreo) with the Exynos 7880 64-bit chipset and with an Octa-core processor at 1.9GHz speed. Furthermore, the phone comes with a 4GB pf RAM which makes it a real smooth, fluid and sleek functional application launcher and runner. Also, the machine would perform multitask functions due to the fast processor and the high amount of RAM. The internal memory at 32GB can be increased by using a micro SD card up to 256 GB. A 3300 mAh Lithium Ion battery is provided to allow the Samsung A5 2018 performing with precise control. As with most of the recent smartphones, the battery is not removable, but the charging time span is relatively fast thanks to the Quick Charge feature provided with this product. Being a product of the Samsung line, this smartphone is well received by fans of the Korean manufacturer and it is considered a good asset to the smartphone family.